Lenovo wasn't going to leave IFA 2012 without introducing a few more products besides its Android-run Ideatab S2110A, especially in the flurry of new Windows 8 devices debuting during the conference. The company debuted a series of new Idea-brand laptops Friday, plus some IdeaCenter A and B-series all-in-one PCs, all compatible with the new OS. "Designed for an optimal Windows 8 experience, users can enjoy up to 10-finger multi-touch for versatile computing…and the Windows Store for access to thousands of entertaining and useful apps," said Wei Jun, vice president of Lenovo's Idea Product Group, in a press release. "These new Idea PCs embody our commitment to deliver products that reflect the style and energy of the user." The IdeaPad U510 Ultrabook, touted as "ultra thin, ultra light," is the next-gen of the U310 and U410. A 15-incher, the U510 takes the durability and capability of a laptop and puts it in a 21mm thick tablet frame. With a third generation Intel Core i7processor and up to 1TB of HDD storage (with an optional 32GB solid state drive cache), the U510 will last up to six hours on a charged battery. It's also got an integrated DVD reader/writer, though users can opt for a Blu-ray Disc drive, for extra viewing pleasure. Look for it in September, starting at $679 (£427). 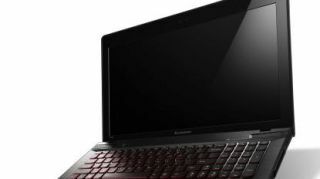 Working its way down the alphabet, Lenovo also introduced the IdeaPad Y400 and Y500, aimed to snare the mobile gamer and multimedia fiend. Though these laptops are sturdily equipped with i7 processors, NVIDIA GeFORCE GT655M 2GB dual graphics, up to 16GB DDR3 memory and a max of 1TB HDD storage, they've also got a feature to take out so more can come in. The UltraBay is an interchangeable bay that users can swap out for dual graphics cards, more storage or pop in an extra fan for cooling. The Y400's got a 14-inch LED backlit widescreen HD display while the Y500's screen has the same specs, just on at 15.6 inches. Throw in JBL speakers, Dolby Home Theater v4, a dual-layer backlit AccuType keyboard and a one-piece touchpad, and these Y's are ready for some action. Both come out in October beginning at $649 (£409). Two more PCs Lenovo's throwing in the mix are the IdeaPad Z400 and Z500, laptops Lenovo said are 25 percent thinner than standard competitors. Third-gen Intel processors, the same backlit screens as the Y's and NVIDIA GeForce graphics come standard. However, users can pick and choose what color their 14- and 15.6-inch laptop (the Z400 and Z500 respectively) come in: coral blue, dark chocolate, peony pink and enamel white are all available in the $549 (£346, starting price) devices. The Z400 hits shelves in November while the Z500 is available in September. Both, by the way, offer access to the Lenovo Cloud and feature intelligent Touchpad. Topping it all off, Lenovo's got four new all-in-one PCs: the A520, B340, B345 and B545. The A520 is a 23-inch, frameless 1080p full HD display device that can be angled to nearly every degree to make movie watching, gaming and whatever else you need to do at -5 degrees happen. It's got a third-gen Intel processor with Intel HD Graphics 4000 plus Dolby speakers, Dolby Home Theater v4, optional Blu-ray and other touch-optimized multimedia apps and games. Coming in at $999 (£629) to begin with, it can hold up top 8GB DDR3 of memory and tops out at 1TB of HDD storage. Look for it in October. If you're in the market for home entertainment awesomeness, then the B's are probably right up your alley. The B340 and B345 have 21.5-inch displays while the slightly larger B545's got a 23-inch front. All are full HD widescreen and frameless. Each supports 3D vision and have 10-point multi-touch technology. The processors here are optional, with either a third-gen i7 from Intel or an AMD quad-core available. Users get a NVIDIA 615 2GB in the B340 while its bigger brothers are packed with AMD's Radeon HD7470A 1GB graphics. Grab a VESA mount for flexible placement plus an optional TV remote for HDTV viewing pleasure. The B340 and B345 are out in October for $599 (£377) and the B545 in April 2013 for $699 (£440). Prices, of course, are to start.